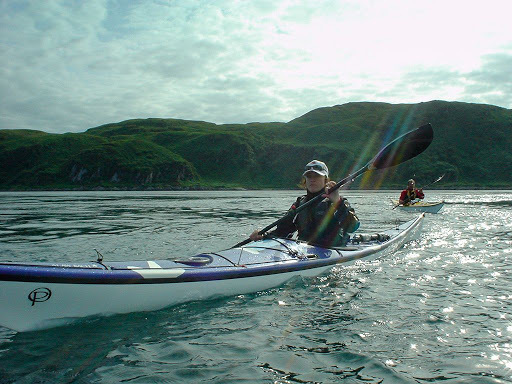 Sea kayaking with seakayakphoto.com: A Corryvreckan eddy. We waited at the SE entrance to the Corryvreckan for 1.5hours after slack water, to let the east going ebb tide build up a little bit. 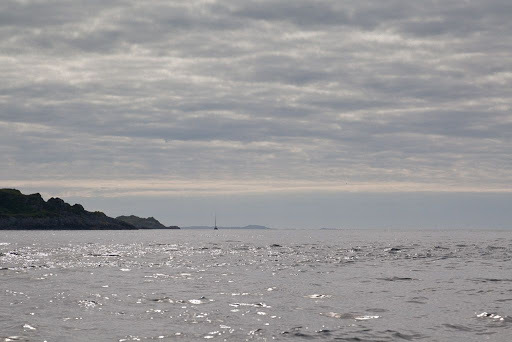 We then launched into a counter eddy, which took us back west at 10.8km/hr into the Corryvreckan again. We were passed by a west going yacht, motoring at full belt on top of the 10.8km/hr of the eddy. It was really nice to see its single handed skipper displaying such a confident knowledge of these tricky waters. We exchanged waves of mutual respect! Tony and I then broke out into the main ebb. The eddy line was rather stimulating and then, out in the main current, huge boils, 150m across, erupted on the surface from the depths below. 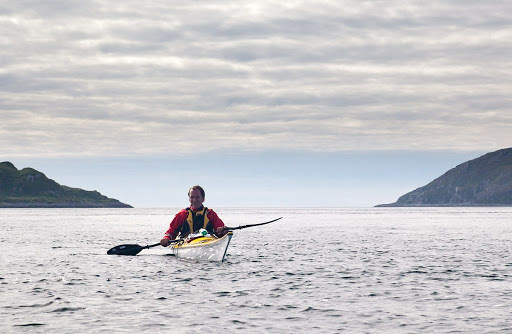 However, there was not a breath of wind and the surface of the Corryvreckan remained surprisingly calm. Even a light wind can turn these waters into somewhere very unpleasant. We were entertained by some porpoises feeding on confused fish. After spending some time in the eddy, Jennifer and Phil came out to join Tony and I. It was their first trip into the Corryvereckan other than at slack water. Once we were all in the main ebb, we found ourselves "drifting" along at only 14km/hr! All too soon, we were ejected from the Corryvreckan. This is Phil's "Been there, done that." photo! 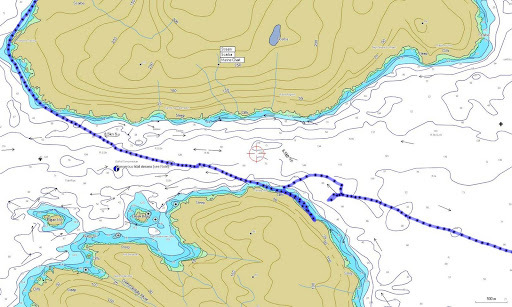 This was our track through and across the Corryvreckan from west to east. Slack, before the east going ebb, was predicted at 16:00, it was 3 days after neaps. 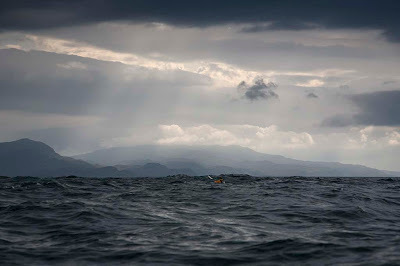 We entered the west end of the Corryvreckan at 15:38, passed 180m SW of the pinnacle over which the whirlpools form at 15:52. at 16:01 the sea went glassy calm indicating slack water. (Note: tidal predictions here are very dependent on air pressure and are only reasonably accurate in the middle of a high pressure system.) We landed at Port nam Furm, at the SE entrance to the Corryvreckan, at 16:18. We relaunched at 17:18 into the west going eddy and finally left the Corryvreckan at 17:46, an hour and 46 minutes after slack water. 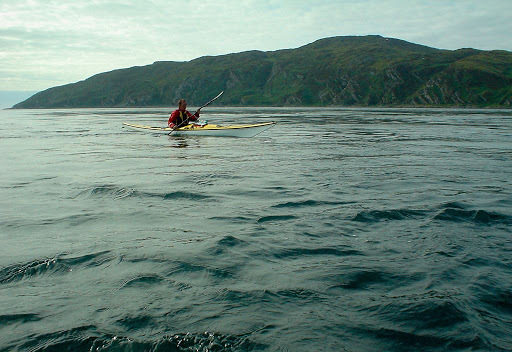 Don't be fooled by the calm conditions we encountered in the Corryvreckan on this current trip. This photo with a little wind shows the Corryvreckan in a much more serious mood. That last image in the post is amazing. It is so atmospheric, I love it when the clouds roll in and there's a sense of foreboding in the air. Well captured, I'm enjoying reading through your posts. Thanks Steve, I had a dry mouth taking that shot!